Remember that not all pets are suited for travel, and depending on the particular animal or breed it may not be wise to travel with them. Take into consideration their personality, anxiety levels, and other health issues that may not do well on longer journeys or in the cargo of a plane. If you are planning on taking them on a flight, know that airlines have all different regulations and fees pertaining to checking an animal as baggage or them riding in the cabin. Be sure to look into this ahead of time. Before a trip make sure to have their seal of approval that your pet is fit to travel. This should include up-to-date vaccinations, and a health certificate. Make sure to always have their medical records on hand in case of an emergency. Ensure that your pet and carrier have identification at all times with your contact information. You don’t want to take any risks when it comes to the whereabouts of them when you’re not in the comfort of your own home. If you’re going on a long car ride, try taking them out on a few shorter test trips beforehand to see how well they do. Some will do better than others, but it’s best to know tolerance ahead of time. Your crate or carrier should be spacious and well ventilated. Your pet should be able to move around comfortably – sit, stand, and turn around. It should also be secured in the case of any sudden movements or stops. You don’t want them tumbling around and getting hurt. This one is so important! The inside of a parked car’s temperature can rise quickly to fatal levels during warm weather. Even if the windows are down, it can become an oven and an extremely dangerous situation. In the winter, the car can hold in the cold temperatures and cause an animal to freeze. Please be mindful and never leave your pet behind. Animals can get stressed out in new and situations. The same as with a child, a familiar blanket or favorite toy can be a calming factor for your pet. It will reassure them that everything is ok and make them feel more comfortable during a trip. Just because you don’t need to use the restroom, doesn’t mean your pet doesn’t. Give your pet a chance to stretch their legs, get some water, and relieve themselves. Plus, some of those off-the-road stops might lead to seeing something cool along the way. Bringing your pet along on a trip can add a whole new level of fun, but it also adds more responsibility. 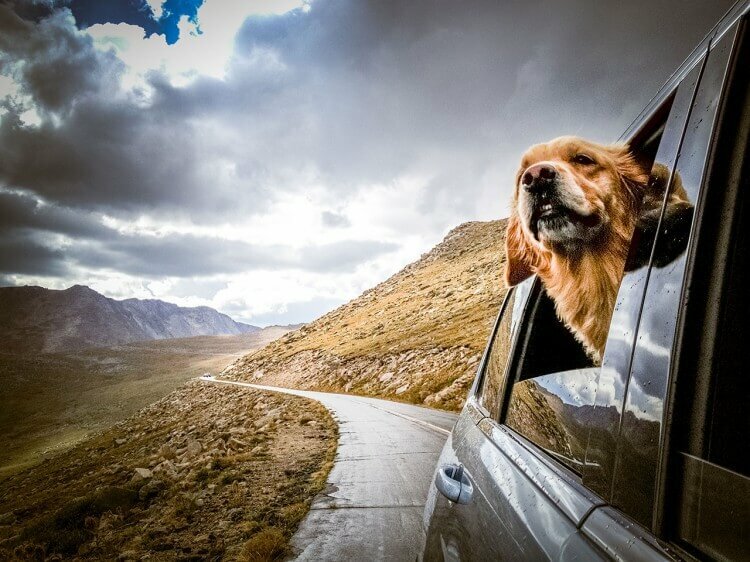 Your pet relies on you to treat them with respect whether you’re at home, in the car, or at 10,000 feet. Please keep our tips in mind when travelling so that everyone has a good time.